The last couple of years have been particularly productive ones for England's Baalberith. The Black Metal quartet unleashed two demos, an EP, and For The Glory Of Blasphemic Supremacy - their epically titled full-length debut. These Brits snared my attention because of their refusal to blindly follow trends, a trap so many young bands fall into these days. Neither overly atmospheric nor starkly brutal, Baalberith's brand of Black Metal instead treads upon a path worn down through the Heavy Metal ages by bands such as Black Sabbath, Cirith Ungol, and Manilla Road. Murderous doses of doomy, traditional Heavy Metal are added to blackened riffs and hellish shrieks to produce an approachable, yet still very lethal, Black Metal elixir. "Countess Bathory", the song that appeals to me most, is perhaps the track that best exemplifies this unholy marriage of styles. If Motörhead were a corpsepaint wearing Black Metal outfit, this is what they would sound like. Adramalech's simple, groovy riffs have more than a bit of a galloping quality to them as they carry the tune from start to finish. Here, as well as throughout the album, Eligos' bass lines are clearly defined in the mix. The strong bass presence is also a notable factor on "Black Metal War", lending the song a significant Doom Metal vibe. While "Bleached Bones" is also dominated by a doomy aura, Eligos and Adramalech team up for some synchronized tremolo riffing to keep things from becoming too stale. Behind the kit, Valefar increases the brutality with a truly cacophonous performance. The traditional Heavy Metal elements are strong throughout the majority of For The Glory Of Blasphemic Supremacy, but on "Bleeding The 5000" Baalberith show they haven't forgotten their hellish mission. An atmospheric guitar intro leads to some substantial tremolo riffing and pummeling blast beats as frontman Razakel shrieks and howls incoherently in his croaking, raspy style. In fact, it's Razakel's consistently demonic performance that reminds the listener that For The Glory Of Blasphemic Supremacy is without a doubt a Black Metal album, not merely a romp through the darkened dungeons of Doom. I wouldn't be doing my job if I didn't remark on the production quality of the album, as it is very boggy and could be a factor for the casual listener. I don't penalize indie bands for production issues, though a well-produced album certainly enhances the listening experience. 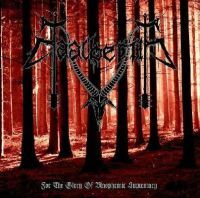 Although what they offer isn't quite revolutionary, Baalberith's sound is unique enough in today's Black Metal world to garner them some well-deserved attention - which in the end will allow the band to devote more resources to the production of their future albums. For now, consider For The Glory Of Blasphemic Supremacy a solid album that hints at the promise within this young band.